After 6 years away from the hobby, I decided to go all out as best I could. This tank I call, "Entraron el Bosque... Aquí. " It is a work in progress, but it is just finally at a place where I am comfortable with showcasing what it is that I am doing. For those interested, here are the details. 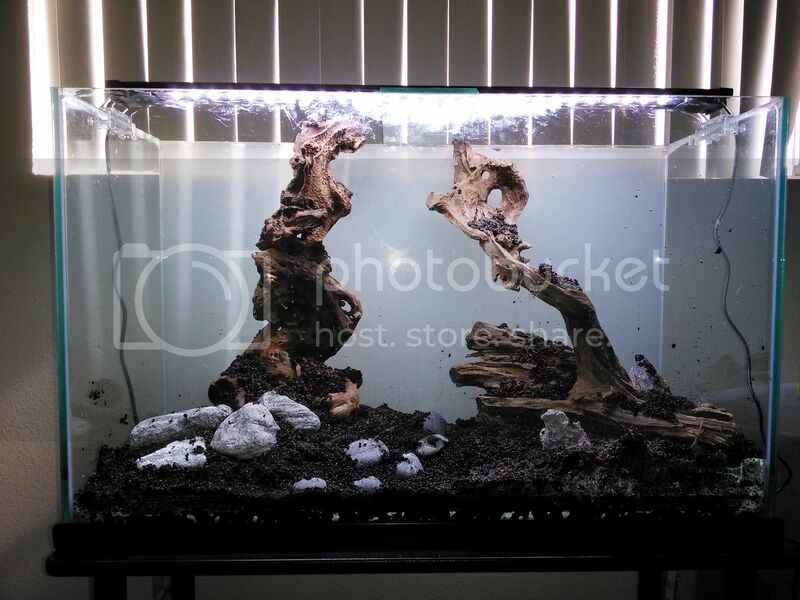 29 Gallon AquaTech Visio Aquarium. 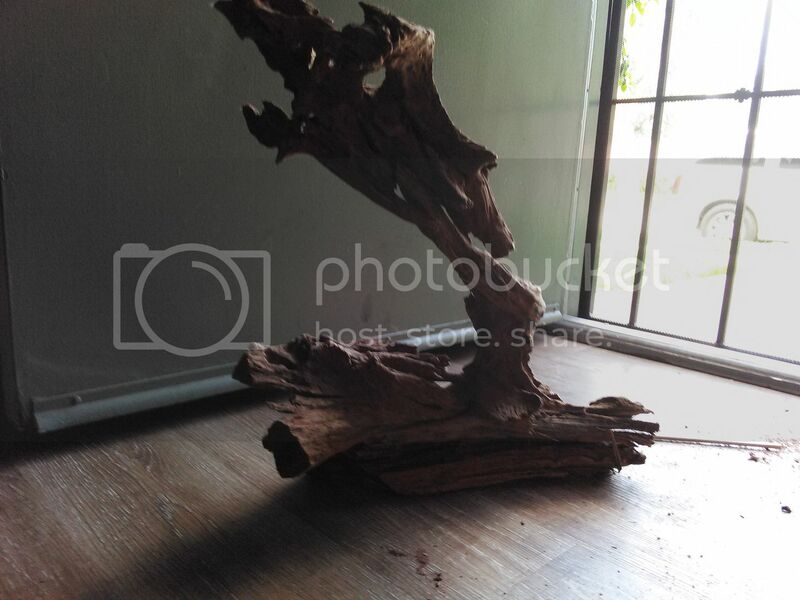 It all started with some simple driftwood that looked as though it was cut from the same piece. Last edited by Tinthalas Tigris; April 27th, 2016 at 08:00 PM. Very cool. What types of fish will you be stocking it with? 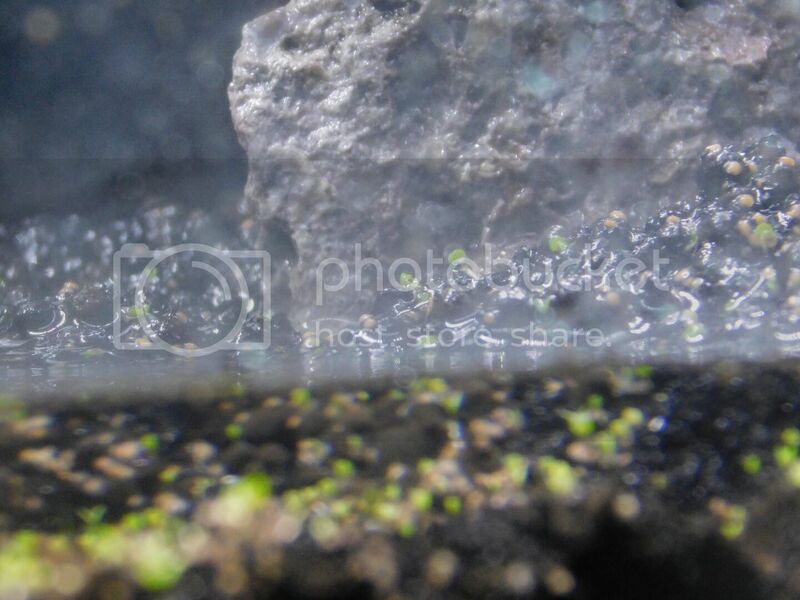 I don't want to jinx myself, because these substrates and flora are completely new to me, so ph and such could come out ridiculous, as well as a whole mess of other strange things i am worries about, but, the theme of the tank is going to be a spiritual, dare i type, ghostly experience. I reassembled it back to its previous life. 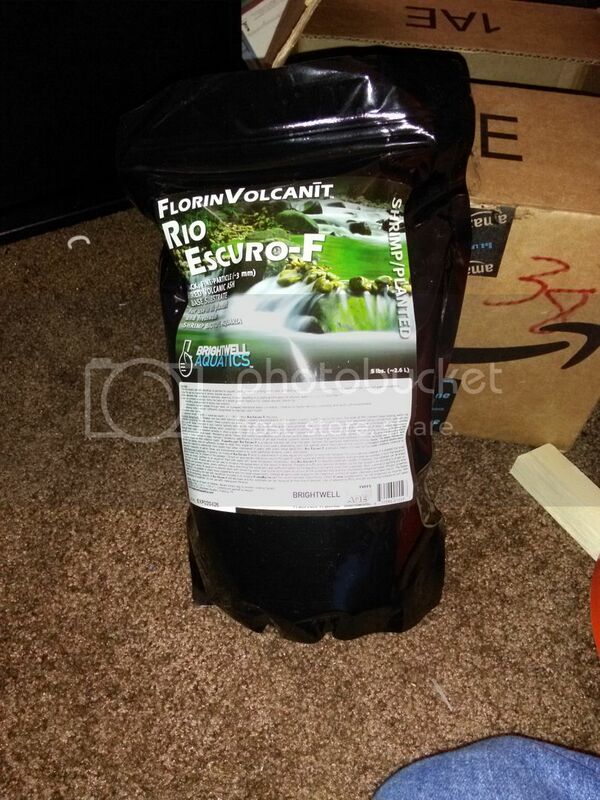 I chose to splurge and explore, and buy some premium gravel from two different sources/brands. They're virtually identical, however. 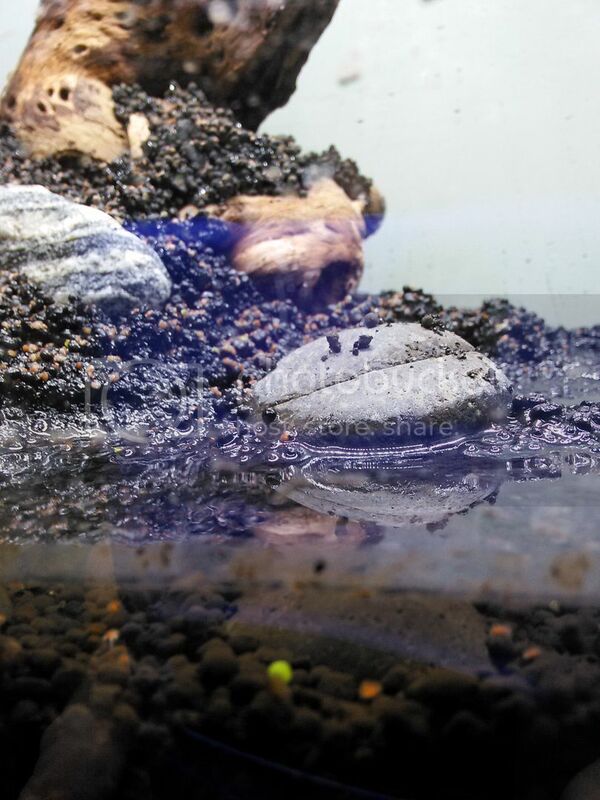 The two gravels on either side of the tank. Last edited by Tinthalas Tigris; April 10th, 2016 at 06:46 PM. There are a number of varieties on the agenda, but we will see. These seeds have not sprouted yet, and i am getting nervous. I am a massive fan personally. 3) http://www.jrslattum.com/product/as-above-so-below <-- #1 favorite, I want the original with all my body, have a print of it in home lab. But, I love any artwork that is recursive or uses the Droste effect  in it well. Last edited by MI Redeux; March 16th, 2016 at 02:11 AM. I can see the tank so I think you missed the mark on ghostly as well as spiritual. There is no water in it yet. This is just the hardscape. I have some cichlids. This guy is a flowerhorn. I would like to do a cichlid tank one day. They're so out there, though, compared to what I am used to. I do like brackish water fish, but I feel like the ones that I really care for would just not go well together at all. I actually put together this tank as a distraction so that I could feel immediate progress while I made a nano reef. But..... like most things, I jumped way too deep and head strong, and I might just abandon the reef idea altogether. I've never actually done one, before, I just really enjoy all the little critters that come in live rock. It was a happy St. patty's day. Glosso SIde shots. 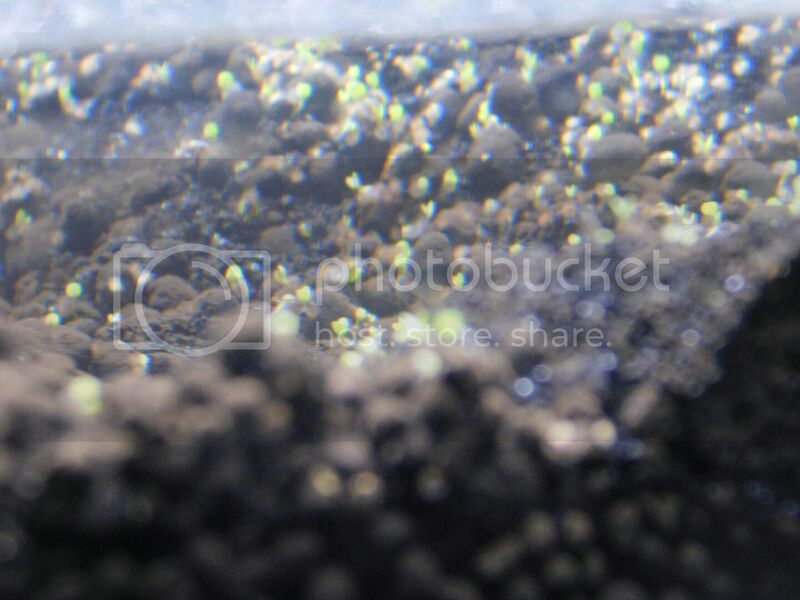 Perspective against small little knot in top photos, left side of tank, Lowest right Mopani section can be seen in these photos. The glosso is small, but the HC (not in these photos) is even TINIER! HC shots. THey are so tiny, I have to really play with the camera (Not a fancy DSLR, just a super zoom) in order to get them to come out in the photos. I've got 3 more packages of plants coming in (I have no idea where I'm going to fit them in......) before I get to final fill. One of my friends is as much of a fish and aquarium nerd as I am a math nerd if you would like for me to ask him for some suggestions for you on whatever. Said friend takes a lot of beautiful pictures with the Camera+ app on iOS . It's amazing to me how much better photos come out with just the app being able to control every facet of the camera manually. It's pretty easy to use. I just wish it supported uploading to imgur instead of some other cloud service I have never heard of or if the app simply included a way to strip exif data within it. But it doesn't. Still, Camera+ is the only great app I have come across in the past 4 years. What is preference to activated charcoal over other mediums for water scrubbing? This is the first canister filter that I've ever used, and I really want to polish the water while cycling my tank. Is there something better than purigen? Updated, I'll try and post another pic tonight. I've never been able to get live plants to work in a tank before because we've always bought them already grown. 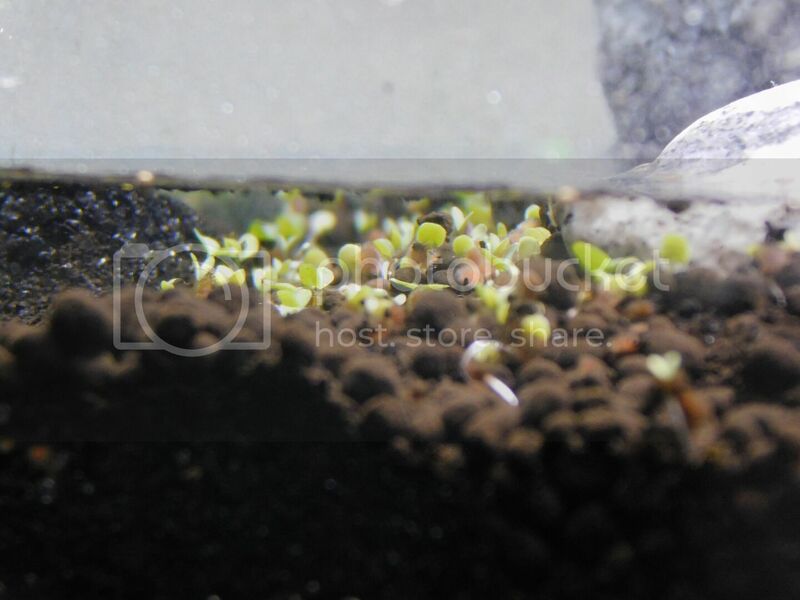 We got around that for a few years with two Clown Loaches (named Hoover and Kennmore) and that worked great for keeping the tank clean, but they also nosed around enough that they dug up the plants, so they'd just float on the surface. They were five inches long by the time they were grown, but they only lived about 4 years before one got sick and passed. The next one went mere days later because they're such social fish. Didn't even show signs of sickness like the other one. Every clown loach we've bought since has been a little under an inch long and COMPLETELY unable to swim in our tank because our biowheel filter is rated for a 50 gallon and we only have a 25, so it make some fairly heavy current. Currently we only have a handful of black-skirted fancy fin tetras and a micro-plecostumus that's about 9 inches long (roughly 6 years old). I like the fact that you grew your own. That tank is GORGEOUS. I sort of got into the hobby by accident. I always had an appreciation for aquariums, but didn't understand a thing about them. From the tiny 0.5 gallon tanks my brother and I got, to the fish bowls that we would keep goldfish in that we won from carnivals and the like, we failed at keeping fish alive, and didn't know anything. My wife and I got the brilliant idea of having fish at our wedding as centerpieces. When we went to look up the prices for everything and all that good stuff, the sales person convinced us that a tank of female bettas was the best idea, so we went with that and bought more than 20 of them. we had them all in a 10 gallon tank before the wedding, and perhaps only 5 to 10 of them were taken. we had at least 15 left, and ended up losing about 8 of them because we didn't know anything about ammonia/nitrogen/filtration, despite doing water changes. So, after we got back from the honey moon, I decided to look into making those 8 live. Long story short, I learned a whole hell of a lot about tank cycling, filtration, water heaters, and you name it. I bought plants, because they would be the smartest thing (in my mind) to make sure I got a cycle going quickly. I ended up with about 4, maybe 5 bettas by the time I got eveything dialed in (maybe 3 weeks after the wedding). About a month after that, i got a 28 gallon bow front aquarium via Craigslist, moved everything over from the 10 gallon, and added more plants. I joined a local "Scape" club which focuses more on the plants and the aquarium design than the fish, and learned many techniques for aquatic plants in general. 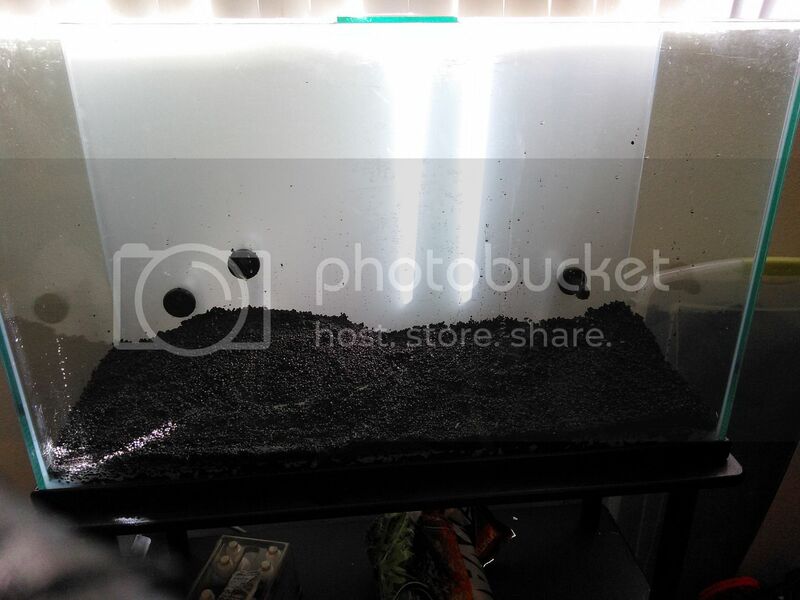 At the end of it all, I ended up having 1 betta survive for a long enough time that I considered it "successful" and then went out and bought a 40 gallon breeder tank, built a stand, and built a tank the way I should have from the get go. It was a very, very successful tank. For some reason though, I lost significant interest, and just sort of abandoned it after about 2 years. I decided to get rid of everything I had, scrap it all, and just sort of left that room as a storage room instead of as a "cave" as I'd always originally intended it for. Then, this past January I decided to clean it out, and start over. The only two plants I started from seed were the Glossostigma and the Hemianthus. They were much more successful than I expected, and far more successful than I've heard from other people who tried the same way I did (from seed). If I ever do it again, i'll probably try and get as many seeds for the plants that I want as possible. It is definitely the way to go. The red plants (The alternanthera reiiniikii) are all Tissue cultured. 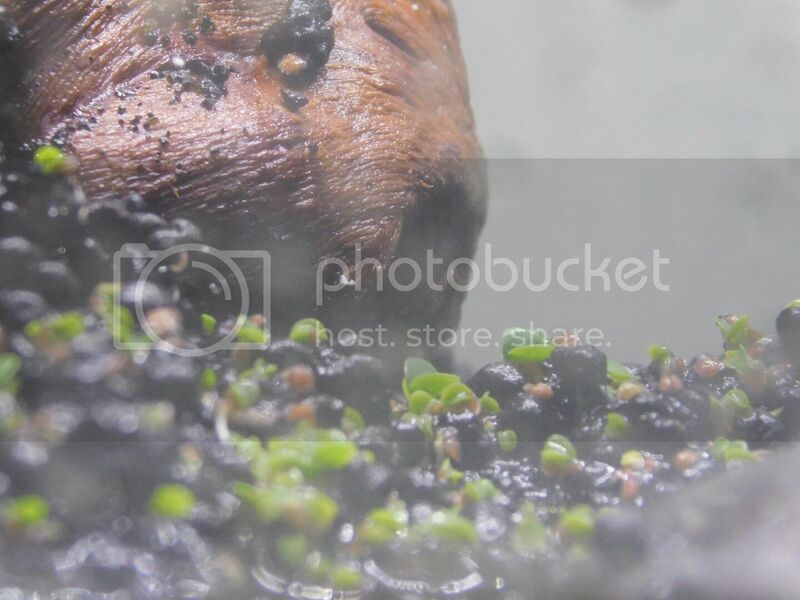 Petco sells them this way, and they're probably the easiest to transition, because you are guaranteed no pond snails, and they are already growing in a hard environment (non emersed). The hardest part is just getting the gel off of their roots and putting them into the submerged scape. 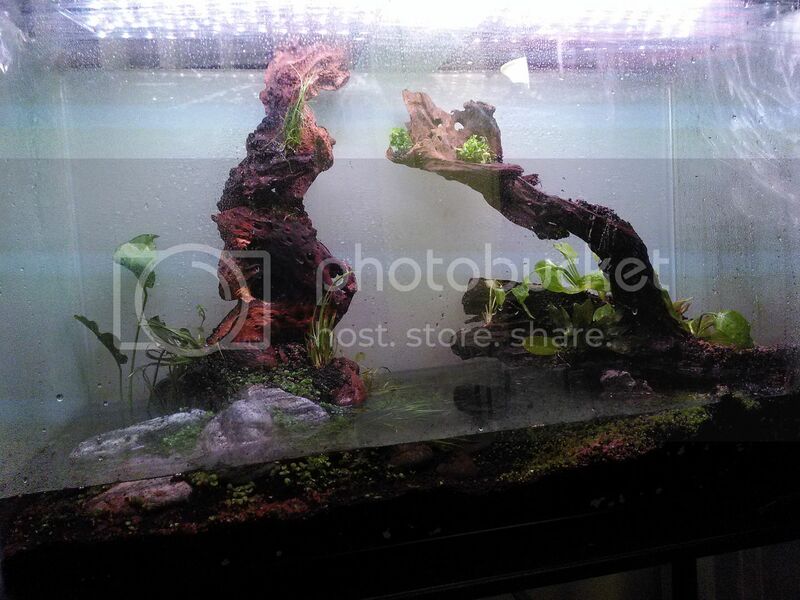 The hardest plants I have are some of the ones on the driftwood themselves; the flame moss and the Staurogyne repens. 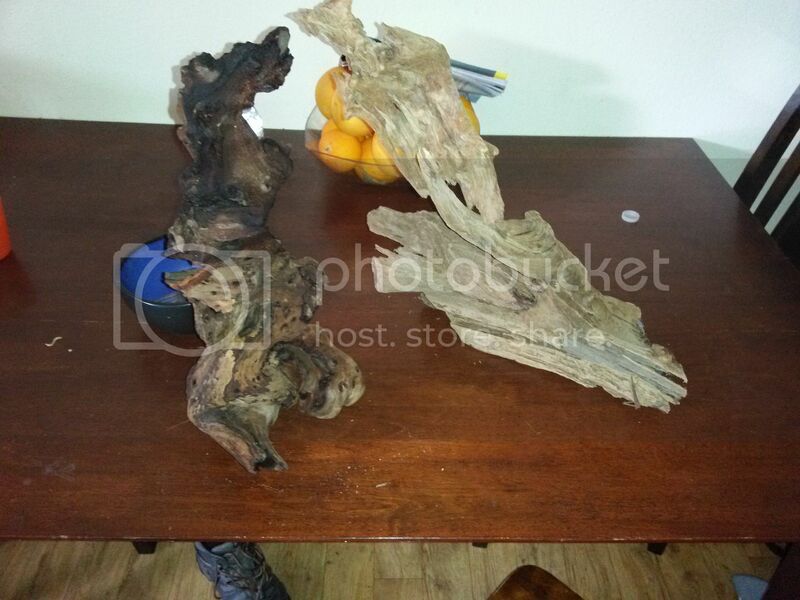 Specifically, the S. Repens is not supposed to grow attached to driftwood. But I made some work around and stuffed soil into the holes in the driftwood and attached the plants with cotton thread. 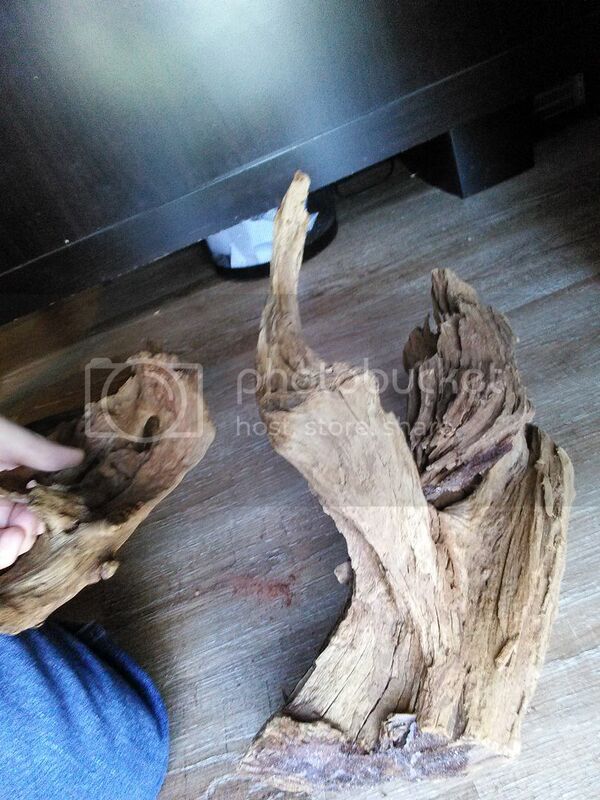 As soon as they propogate roots through the soil and into the driftwood, all I need to do is fertilize the water column, and they are fine. 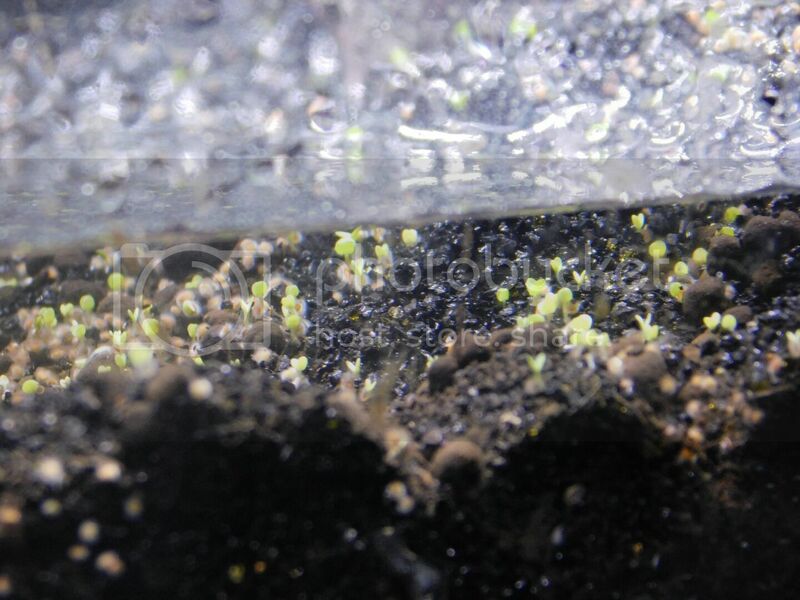 They'll never grow as quick as plants directly stuffed into the soil substrate, but I don't want them to get to big. I still have a bit of work to do on the background parts, and that is the portion of the tank I thought the least about while scaping it. because of the way the driftwoods are positioned, it is nearly impossible to get my hands back there in order to stuff plants in there. As some of the ones that I have up front propogate roots, I'll cut their tops and drop them in back. 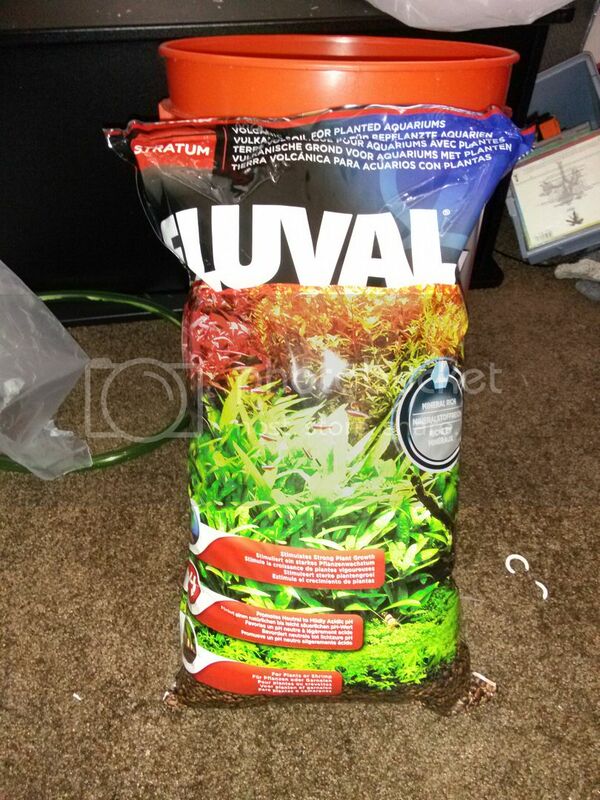 "Activated carbon is cheap and works well, purigen and chemipure work well but aren't at all necessary unless you're battling nutrients issues even with proper maintenance." Nerd only does fresh water tanks afaik.